When doing research have you even wondered what happened on a specific date but just a different year or time period? With the help of the Internet this kind of information is relatively easy to obtain. With a few key strokes one can learn about what happened when they were born and what happened on that date over a period of time. These sites help to create a timeline that includes events going on in the world around you. The first one of interest may be What Happened On My Birth Date? Using dMarie's website, http://www.Dmaire.com/timecap you can easily discover all that was happening on your birthdate. Note that there are two different customized reports. A "Quick Page" will generate a Time Capsule page for you and the "Advanced Page" allows you to add additional information by topics as well as adding your own headlines. Either way, one can easily use the results to add into one's own timeline. While one may not wish to go back quite this far in a timeline, it does provide information up to current times! 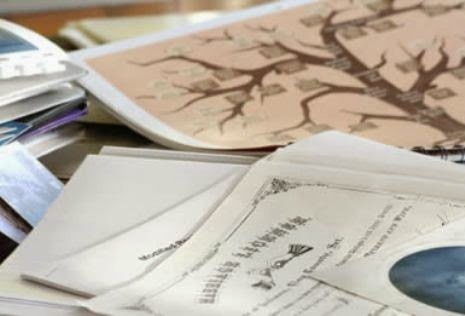 Either way, each of these sites can help with filling in additional events in an ancestor's timeline. These timelines come with some preset events, however, clicking on Options allows one to add additional items, adjust the colors, etc. Take advantage of building your timelines for your ancestors as well as yourself! AQ: Other Events..Taking Advantage of this Resource! Throughout one's life are many events that occur besides the birth, marriage and death. In fact, we are reminded in a poem entitled "The Dash", written by Linda Ellis of just how important one's time here is to those whose's lives were touched in some way by that person. Usually those individuals are family members, friends, colleagues who had the opportunity to know an individual. Ancestral Quest has a way to record those additional events, like the first day of school, joining a sports team, winning an award, participating in a play, joining the military, finding a true love, getting that first job and so many more events that are worth remembering and recording. The 'other events' are interwoven throughout the timeline very nicely. Be sure to take the time to record those special events for your family members. Are you a PAF User switching to Ancestral Quest and confused on how this is done? Generally individuals who are switching from PAF to AQ have been using PAF for years. It is because of the special relationship between these two software programs that switching from one to the other is rather simple. 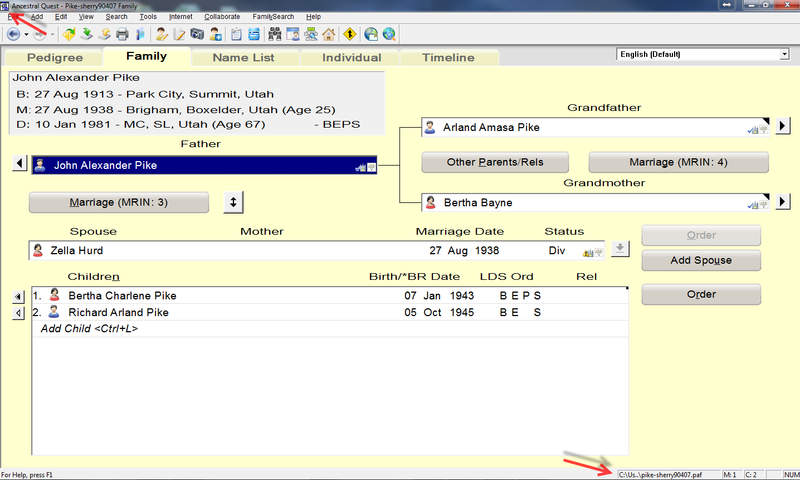 The windows version of PAF was created from the code provided to FamilySearch by Incline Software in 1999. PAF 4 was nearly identical to Ancestral Quest Version 3, except for the different name and a few other minor changes. PAF 5 went through some additional changes before its final release in 2002. Over the years, Incline Software has continued to improve upon the software, the resulting effects are that PAF users will feel right at home and be able to continue to use features they have come to expect along with new features that were created since 1999. When choosing to switch to Ancestral Quest, one has the option of trying out the free AQ Basic version or purchasing the full version of AQ 14, either way one will be able to view those PAF files very easily. Double click this icon to open up the program which will be just an empty database at this point. Click on the PAF file and then click on Open and your database will open up inside of Ancestral Quest! Note that one is in Ancestral Quest as shown in the top left hand corner and you have opened a PAF file which is evident in the lower right hand corner. 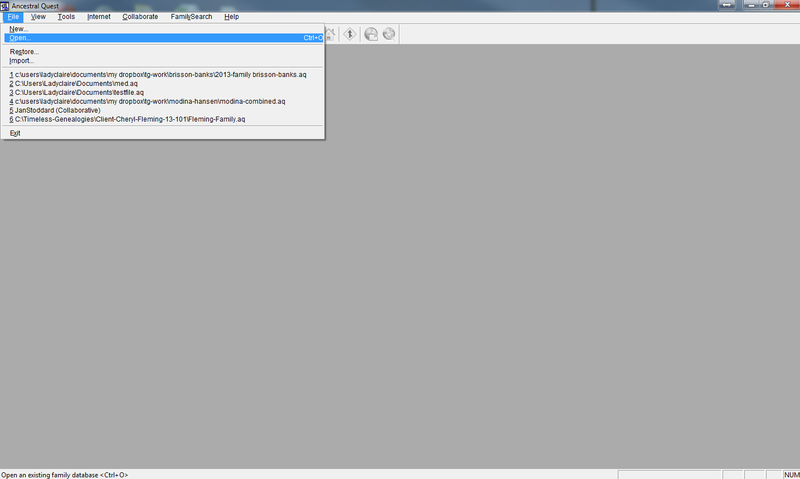 At this point you can choose to continue using your database as a PAF file or convert it to an AQ file. 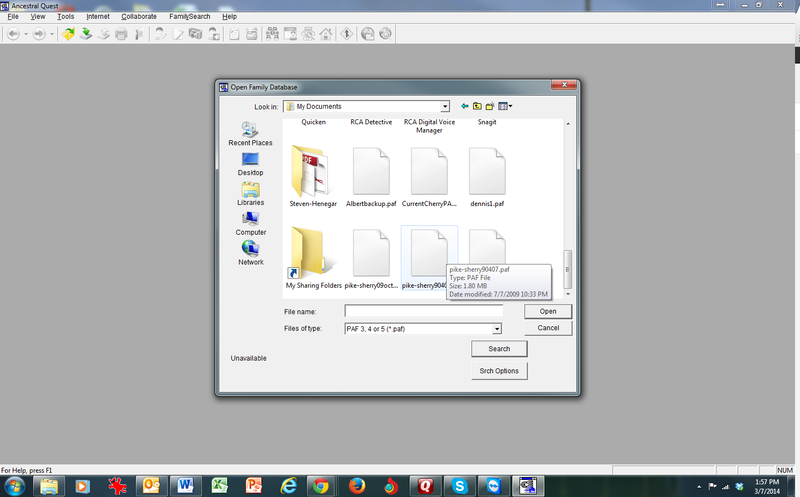 Converting to an AQ file is covered in one of the two videos. We've created two videos to help with PAF files, enjoy!